1. And also not for nothing, as a kid, players with unique names, like “Bench” (after all, what do the players sit on in the dugout? ), just had a little extra flair of coolness about them. Bench is a legend. A rare talent. In the age of little offense (compared to today) he was a giant. And, that defense. Sh!t! No one compared. That is a great pciture of Bench looking invincible. This is one of my favorte all-time cards. I can still remember getting it from the pack. You were talking about how you remember exactly where you were when you found the ’78 George Foster card? I remember exactly where I was when I found this card. My family and I went to Queens right around the end of June during the summer of 1976. We were attending a going away party for one of my father’s aunts. My family is french and this particular aunt was going back to live in France after living in the states for 25 odd years. At one point a bunch of the adults must have given us money to go down to the local candy shop at the end of the block. I remember it was one of those old New York style candy shops with the soda fountain and everything. We had nothing like that in the suburbs of Jersey. I can’t remember if it was a cello pack or a regular wax pack but I remember it was kind of a big deal that I found The Bench card. I remember coming back to the house thinking I was all cool because I had a Bench card. Everybody wanted to take a look, I was the king of the 9 year olds for the rest of the afternoon. It’s hard to remember now but back in the day most people weren’t familar with baseball players but Bench was an exception because he did so many t.v. adds. Even the old french people and the girls knew who Johnny Bench was. “He’s the catcher,” or “Oh that’s the guy that sells spray paint” they would say in their French/Queens accent. I still think this is one of the coolest looking cards I’ve ever owned and it does have a kind of modern day Gary Cooper look to it. 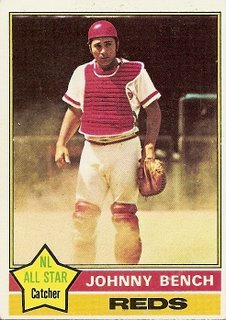 I remember that was the summer I got the “Johnny Bench batter-up” which was kind of like the coolest toy for boys on the market in 75-76. It never worked like it did on t.v. and the rubber bands always used to break. There were a few months in ’76 that I wanted to be a catcher but my little league coach wouldn’t let me switch from short-stop. I probably would have gotten killed back then I was so damn skinny. Anyway I used to pretend I was a catcher in my back yard imitating Carlton Fisk or Johnny Bench or John Sterns. It was always the same play, the Carlton Fisk foul pop up they used to show on “This Week in Baseball” with the violin music playing in my head. Around my house Bench was always referred to as “He’s the Catcher”. Beautiful and dangerous, Like Mantle running out a drag bunt single or Dirty Harry busting up a robbery with six filthy rounds. Man, I loved this card. Johnny Bench was, quite possibly, my favorite “enemy” player of the 1970’s (I was, and remain, a perversely loyal Cubs fan). I loved the ’75 card even more, though. I got that card and Gaylord Perry in the same pack while visiting my cousin in Minnesota and that wast the first time I ever got two “All Stars” in the same pack. ’75 & ’76 were the first two years I collected and I always thought the all-star “star” was the coolest thing in cards. godfrey (are you a Viking? ), I agree, this is one of greatest cards ever. The way it is light on the bottom and dark as you go up is evocative of great works of art from 500 years ago. It is light at the bottom, get mixed and then goes to dark, and all the while Bench perseveres, above worldly concerns of light or dark. Plus, he looks really cool. As Josh mentions, Bench looks like a gunslinger, and the “All Star” almost serves as a Sherriff’s badge. I was seven when I got this card and didn’t know all that much about baseball, but I knew the “All Star” designation was very special and I remember asking an older cousin about this card in particular and he said, “He’s one of the best.” When I think of my initial thrills of baseball, I think of this card. Bench is my all-time favorite player. While a few of his cards were duds (the ’77 face closeup is the worst) a lot were excellent. In addition to this one the ’73 also has a great in action field shot. One other thing I love about this card, in addition to the gunslinger dust you mentioned? The star representing the all-star status carries a badge-like vibe. I’d never seen this card until Josh referenced it in his “greatest card of all time” post, and wow, that IS an awesome card. I think the combination of the dust and Bench’s shin guards give the image of a gladiator that has just vanquished a foe. Fantastic picture! Cool to see this getting so many mentions in the ‘greatest card’ conversation. Bench is my all-time favorite player so it’s hard to pick just one. In addition to the ’76 I also love the ’73 (going for a foul near a dugout), ’74 (great swinging the bat shot), and ’70 & ’75 (crouched in the catcher’s position). I have every Topps Bench card except for the ’68 (rookie) and ’72 (posed holding a bat). In some ways I don’t want the rookie. It’s always seemed one of those unattainable life goals, especially when I was a kid. Yeah, I’m an adult and could go online right now and buy a dozen of ’em. But in many ways that would remove the mystique the card has always held for me. The National Leaguers knew it was foolish to try (I love Josh’s comment on this card). Bench in 1970 may have had the best season ever for a catcher: .293, 45 HR, 145 RBI in 605 AB (+35 doubles and 4 triples).